Villas in Almancil offer you easy access to the golden sandy beaches and top notch golfing opportunities of Quinta do Lago and Vale do Lobo but with your base in a traditional local town rather than a big resort. Almancil is an attractive destination in its own right. As well as a great selection of bars and restaurants, Almancil has more than its fair share of cultural venues, as well as interesting food shops and several markets for you to peruse.Villas in Almancil offer you easy access to the golden sandy beaches and top notch golfing opportunities of Quinta do Lago and Vale do Lobo but with your base in a traditional local town rather than a big resort. Almancil is an attractive destination in its own right. As well as a great selection of bars and restaurants, Almancil has more than its fair share of cultural venues, as well as interesting food shops and several markets for you to peruse. Almancil is located 8 miles north-west of Faro International Airport – about 15 minutes’ drive away. As a busy working town, it offers all the services you would expect such as medical centres, banks, a post office and taxis. Almancil also has many designer boutiques and shops selling luxury goods such as handbags, shoes, perfume and jewellery. It is just a 10 minutes' drive inland from the fabulous beaches, shopping and fine dining found at Vale do Lobo. Golf is probably the major draw for many visitors, and villas in Almancil are ideally placed to give you access to the golf courses. 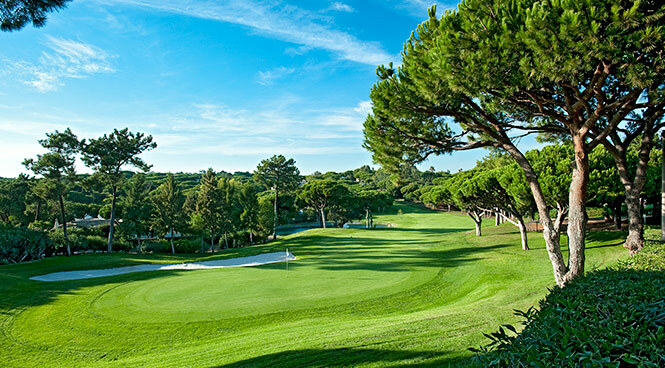 Between the glamorous resorts of Vale do Lobo and Quinta do Lago is Vale do Garrao, just just over 3 miles from Almancil. This small, well planned development is a must for golfers, with its own 27-hole golf course. If all this exercise is making you hungry, you are in luck as Almancil has a fantastic array of restaurants which are easily accessible from your villa. Within a few streets you can try Portuguese, Chinese, Indian or Italian, to name but a few options!